OVER 25 YEARS OF EXPERIENCE WITH ALL-METAL AIRCRAFT FLOATS! Zenair floats feature individual compartments separated by full-size bulkheads, a rugged custom extruded aluminum keel, and a ‘walkway’ stiffener along the top. Quality marine adhesive sealant makes the floats exceptionally watertight, and the conventional sheet metal construction is easy to assemble from a kit, to maintain and to repair. 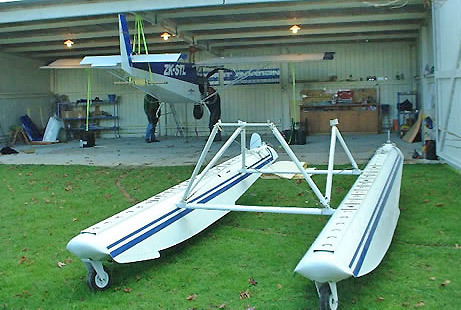 The 4-wheeled version of the AMPHIBIOUS FLOATS allow the aircraft to be mounted higher off the ground than with the original 3-wheeled version. The hydraulically retracted nose wheels are self-centering free-castering wheels. This provides for smooth operation at any airport. The main wheels are extra large for grass field landings. Zenair Floats are some of the lightest available on the market – this fact alone helps minimize performance loss when adding floats to your aircraft. 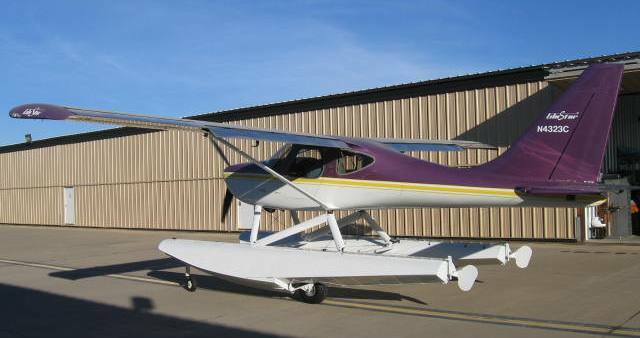 Our standard aircraft floats (straight and amphibious) are simple, light and basic and can easily be customized by builders looking for more features or accessories (i.e. lockers, inspection hatches, in-steps, built-in pumps, cleats, paddle clips, etc.). If a float is ever damaged, simply apply a patch to seal the damaged area. Additional corrosion protection can be added when operating the floats in salt water. Zenair floats are available as parts kit, pre-drilled parts kit or factory built and ready to install. Beautiful Glastar on Zenair #2500 Amphibious floats. · All hardware such as rivets needed to assemble the floats including adhesive sealant. · Hydraulic pump (manual) system for lifting the wheels including cylinders & all hardware. Assembly manuals and all related information necessary for the assembly and finishing of your own Zenair Floats are available on-line at the password-protected "Builder-Reserved" sections of www.zenair.com. To receive your password, simply follow the instructions here. Note: Only confirmed Zenair customers will be granted access to this information. Specifications, availability and all related information subject to change without notice.